Born in Fitzwillam Quay on the River Dodder, Dublin, Ireland. Studied art part-time at Buckingham Gate School, London, the National College of Art, Dublin and University College, Dublin. He was awarded a Master of Arts Degree at City University, London in 1988. In 1974, three of Maher's plays were produced in the Lantern theatre. "SOMETHING GOES,SOMETHING STAYS" was produced in the Peacock Theatre Dublin. It was directed by Jim Sheridan. The play "A REVOLUTIONARY RECALLS" was inspired by a series of paintings which were shown in Dublin, Stirling and Edinburgh. 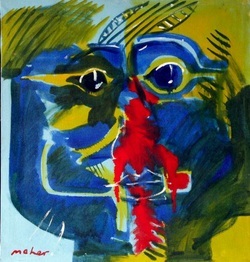 In 1985, Maher moved to London and showed at the Cut gallery, Waterloo. Graduating in Art and Education in 1988 Maher's work was later shown in many prominent galleries. This culminated with a major exhibition of his work in the home of the Young British Painters - the Goldsmith Gallery, University of London. "the foremost among Irish artists working in Britain". John Maher began to travel widely. He became affiliated to the gallery of Robert Oliver in Cannes. 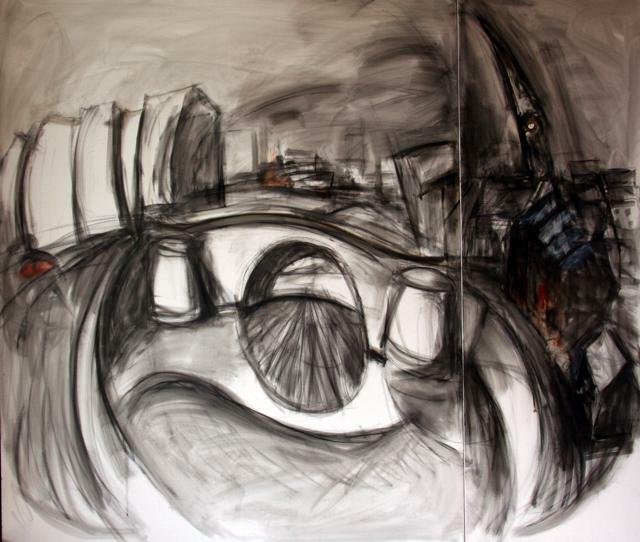 His work is shown in France, Italy and Spain where he settled for a year.showing in the Kieisler Gallery and the Taller con Tinta Roja in Marbella. Invitations to show came from the Accademia Bordighera in Northern Italy, the United Nations Palais des Nations in Geneva (two exhibitions). This was succeeded with works in The British Council in Ghana and the Galerie Bel-Air Métropole in Lausanne and Galerie de Rolle in Switzerland. In Ireland at this time his work was shown at the Irish Distillers Gallery, the Davis Gallery and the Dublin Civic Museum. 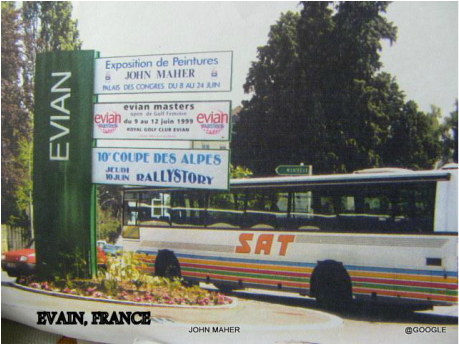 The town of Evian on Lake Geneva showed a retrospective of 126 of Maher’s painting as a Millennium event in 2000. 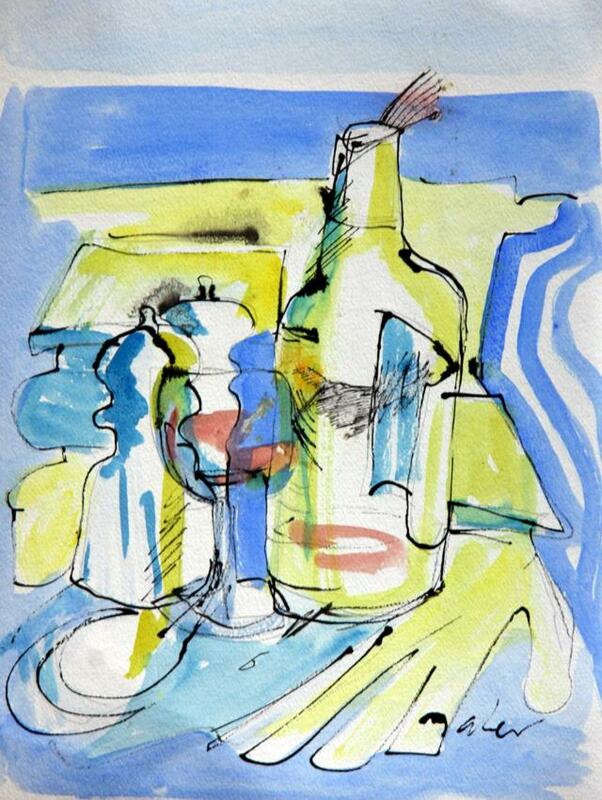 In 2002, his drawings were shown in the Royal Dublin Society and later at the Kreisler Gallery Marbella, Spain. Returning to Dublin where started to work on a wide series of new paintings which includes Pendulum, Half-Rembered Images,The Bridge and a series of computer graphics. 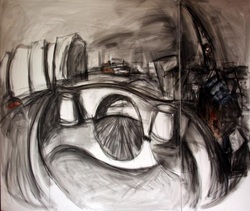 He is currently working in France outside Paris on a new series of large works called Undergrowth and other works. 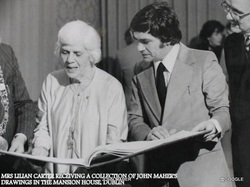 The artist with ms Lillian Carter-mother of the US president when a book of his original drawings was presented to her by the Lord Mayor to mark the occasion of her visit to Dublin with U.S. Peace People. 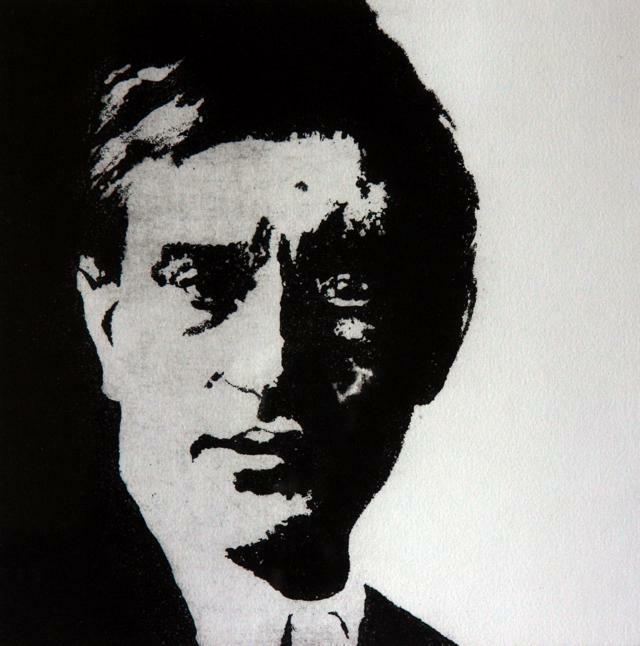 In collaboration with prizewinning Spanish engraver Ana Matias, Maher has completed a series of portraits including the Irish labour leader James Larkin, as well as many others to which he is drawn. This show led to invites from other countries including Iran and China and the town of Evian in France. This formalist image of a bridge over Dublin's river Dodder is a view from the house in which John was born and reared is part of a set of six bridges as referred to in Joyce's funeral itinerary in 'Ulysses'. 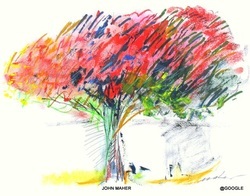 Maher's boyhood fascination with certain trees began when he regularly visited Dublin's many woodlands and noted the variation in character of trees. His copious studies and sketches later combined with his artistic themes. Email: jonmaherstudio@gmail.com Telephone +353 1 6674204 Mobile +353 87 9726877 Studio address: 30 Northumberland Road, Ballsbridge, Dublin 4, Ireland.